Clients are often asking how to create a simple, quick and healthy breakfast. Lets face it, smoothies are the best fast food out there. With healthy fat, protein and veggies they make for a complete meal. They are great for boosting your energy, crowding out refined carbohydrates and sugars, increasing your immune system and are full of antioxidants. Here is the thing, Moms, well, they are always right. Yes, breakfast is the most important meal of the day. A healthy breakfast supports focus, energy, hunger levels, and cravings. So get up, make a tasty smoothie and conquer your day! 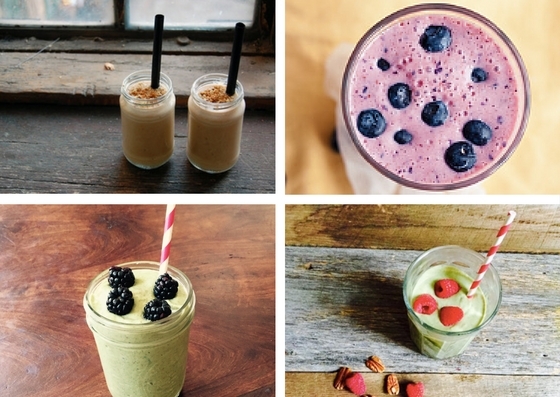 Here is your guide to building a healthy & tasty smoothie. Write me back and share what you have created using these tricks. First off, you want to think liquid salad. If we pack the blender with fruit and fruit juice, our healthy drink just got very sugary. This will set your blood sugar on a roller coaster ride for the day and directly impact the amount you eat. That is why I like to think veggies more than fruit. Or fruits with a lower glycemic index — cherries, pears, grapefruit, apples and berries. Milk Alternatives- are a great way to add protein and healthy fat to your beverage; stabilizing your blood sugar and creating a filling breakfast. Examples: hemp milk, almond milk, coconut milk, cashew milk, and rice milk. Note, read your ingredient lists when buying these milks. Pick ones with minimal ingredients and most ideally, ingredients you can picture. I have found that the “cleanest” coconut milks come in a can. Find a can with the BPA free lining. Tea- boil up some tea, let it cool and use it as your smoothie liquid. Not only will this taste wonderful, but also many teas have their own set of health benefits. Add in a little extra flavor and antioxidants to your smoothie by using tea as your liquid. Here are some examples: ginger, lemon, green, wellness teas, fruit & berry flavored teas etc. Steamed Veggie Water– Yup, that water you usually throw down the drain is full of vitamins and minerals that were released during the cooking process. Please note, that you only want to use the water from ORGANIC veggies. Otherwise, you are drinking a chemical cocktail. Furthermore, stick to root veggies and squashes like beets, carrots, zucchini, and turnips for the best health benefits. If that feels like too much to remember, stick to the other liquids. Water- Don’t shy away from simplicity, just add ice and water. Or get fancy and use coconut water which adds a nice kick of electrolytes. However, saying that, if you’re not getting a good sweat in that day, coconut water has a lot of sugar in it. So keep it to days you need the reboot after a good workout or hot yoga class. Probiotic Punch- Try some whole fat, low sugar yogurt or kefir for a thicker, healthy fat and protein smoothie. When making your smoothie, allow liquid to cover all other ingredients for the best texture. I usually lean one of two ways for my smoothies: a filling, and protein packed drink or a refreshing, hydrating, nutrient dense blend. The” filling smoothie” option would usually be in place of a meal, or when hunger is super high between lighter meals. Where as the refreshing option is great for after a hot yoga class, snack between meals and blood sugar stabilizer before a dinner out with lots of tempting trigger foods. Choose a heavier and creamy liquid like nut milk, yogurt, or kefir. Ready to kick start your morning, add in a shot of espresso. Be Sweet: Add something sweet for flavor, frozen or fresh fruit and berries like banana, blueberries, dark cherries, pineapple, strawberries, acai berries and goji berries. Or a drizzle of honey or unsweetened coconut shavings. 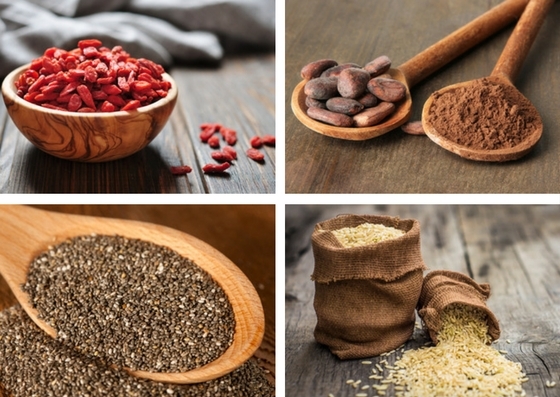 Don’t forget about dried spices like nutmeg, cinnamon, or maca powder for a superfoods kick. Oh and vanilla can be a nice addition. Option to crunch it up. I personally can not get enough of the smoothie bowl. Top your smoothie with nuts, seeds, berries, sliced fruit, flax meal, or granola and eat it with a spoon. You will love this, I promise! Increase your flavor profile- refer to step 3 above to sweeten things up or expand by adding things like fresh ginger, lemon/lime juice, watermelon, and fresh or dried herbs (herbs have natural essential oils and support digestive health) like turmeric, cayenne, basil, parsley, or mint. Always add ice and if you want some texture, top off your smoothie and refer to step 5 above. 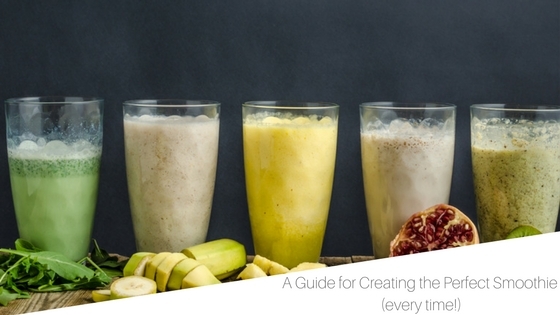 Okay, I am keeping examples light because I want to hear what you create using this smoothie guide! 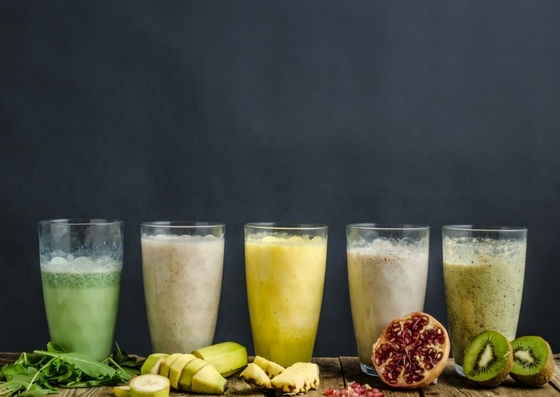 Using less is more with smoothies, pick a couple tasty ingredients, blend and go. Happy creating and remember to comment below and let me know what you make up, I love hearing from you.